Carlton Earl Samuels has a distinguished career in the field of Financial and General Management. As Financial Manager and Consultant, he has worked in several private and statutory organizations. With the launch of JN Bank on February 1, 2017 and the restructuring of the Jamaica National Building Society, Mr. Samuels was appointed Chief Development Financing Officer for The Jamaica National Group. Prior to this appointment, he held the position of Assistant General Manager, Group Finance and Mortgage Operations. In recognition of his outstanding leadership as Managing Director of the National Housing Trust and his contribution to the housing sector in Jamaica, he was awarded the National Honour, Order of Distinction (Commander Class) in 2006. He has served on several civic boards and societies, thereby contributing to community and national development. Currently, he serves as Trustee for the Cornwall College Trust. 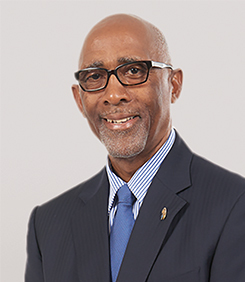 In 1997, he was the recipient of the University of Technology (UTECH) Outstanding Alumnus Award, and in 2006, he received the Distinguished Rotarian Award from the Rotary Club of St. Andrew. In recognition of his contribution to the development of Cornwall College, he was awarded the Man of Might Award in 2012 from the Cornwall College Old Boys Association (CCOB). In 2016 he received an award from the Kingston Chapter of CCOB for his contribution to national development. Mr. Samuels, a Justice of the Peace for the city of Kingston, is married and has three children.